Roland's Jupiter 80 has gained a little brother in the shape of the Jupiter 50. Does this slimmed-down synth offer the same Supernatural sound? Like the Jupiter 80, the 50 generates its sounds using a virtual analogue synth engine called Supernatural Synth, coupled with a selection of acoustic models called, with devastating predictability, Supernatural Acoustic. The synth engine builds its patches (which Roland call 'Tones') from up to three Partials, each of which offers seven virtual analogue waveforms with three variants, as well as PWM and SuperSaw depth where appropriate, plus a PCM option that offers 363 waveforms. Not just an oscillator section, each Partial is an independent synthesizer with a pitch envelope, a multi-mode resonant filter, a high-pass filter, dual ADSR contour generators, dual LFOs, waveshaping, unison, analogue feel and more. As I discovered last year when I reviewed the Jupiter 80 (see Sound On Sound, August 2011), a polysynth patch built on just one Partial can be a powerful beastie in its own right, and one built on all three of them can be monstrous. Despite what the nay-sayers may claim, the Jupiter 80 was always capable of some lovely recreations of analogue synths, as well as more modern sounds, and this ability is further enhanced in the Jupiter 50 (and on the Jupiter 80 version 2 — see box) by the addition of three new low-pass filter options within each Partial. LPF2 is based upon the Jupiter 8's filter and, while there's no documentation to say what LPF3 and LPF4 might be, rumour has it that they are based on one of the Prophets and an unspecified Moog. This can't really be true, because all four filters offer 12dB/oct and 24dB/oct options but, whichever way you look at it, that's a lot of low-pass filters, and very nice they are too. Despite the loss of the colour touchscreen, I found editing to be straightforward in 'Pro' mode on the 240 x 64 pixel monochrome display, which presents everything in a long, vertical list of parameters. For players who prefer a graphical approach, this is also provided, although, inevitably, it's much lower resolution and less immediate than that on the Jupiter 80. Interestingly, Roland will soon be releasing an iPad editor for the Supernatural Synth engine. At first, I was bemused by this idea, especially since the software is unable to edit the Supernatural Acoustic sounds, Live Sets or Registrations discussed below, but I later realised that sitting an iPad on the Jupiter 50's control panel is in principle no different from placing a PG800 controller on a JX8P or Super JX10. Well, no different except that an iPad is considerably cheaper in real terms than a PG800 was in 1985, and you can't surf the web or read your emails on a dedicated programmer. I must admit that I'm beginning to warm to the idea. To supplement the Supernatural Synth, there are 117 underlying Tones in the Supernatural Acoustic engine. Although the Tones originate from samples, these are used to derive and build physical models of the original instruments, and an additional layer called Behaviour Modelling Technology then seeks to convert your performances and phrasing (as played on the keyboard) into appropriate performances and phrasing for the instrument being synthesized. The parameters available for each Tone reflect this. For example, acoustic pianos offer control over string resonance, key-off resonance, hammer noise, stereo width, nuance and tone character, while the tonewheel organ model, derived from Roland's dedicated digital organs, offers control over the nine standard footages, plus leakage, percussion and key click. By contrast, most of the electric pianos and clavinets offer just one parameter, while the guitars, basses, flutes, oboes, violins and whatnot lie (in terms of complexity) somewhere between, offering parameters such as strum speed, strum modes, growl sensitivity, and variations with names like staccato, ornament and flutter. These let you sculpt the initial Tones within the limits of the original instrument although, in common with the Jupiter 80, there's still no dedicated memory for storing an edited Supernatural Acoustic sound, which you have to save within the Live Set in which you altered it. Ah yes... Live Sets. As on the Jupiter 80, you can select any four Tones (whether generated by Supernatural Acoustic or Supernatural Synth) and layer them within a composite patch called a Live Set. This is where you'll find the editing parameters for the Supernatural Acoustic sounds, as well as a set of parameters that further modify the three Partials within Supernatural Synth sounds. It's also where you can perform 'Tone Blending', which allows you to adjust multiple parameters simultaneously, defining the start and end points of the transitions within each of the Layers to create all manner of interesting morphs ranging from (say) the introduction and elimination of instruments, to extreme filtering and unusual sound effects. The Jupiter 50 has a 76-note keyboard and measures 127 x 36cm, but its largely plastic construction makes it far lighter than its sibling. Now we come to a major difference between the original Jupiter 80 and the Jupiter 50. In fact, we come to a major difference between some of Roland's own blurb describing the Jupiter 50 and the Jupiter 50 itself! To understand this, you have to remember that the Jupiter 80 only allowed you to pass sounds through its MFX effects processors in parallel, one effect for each Layer in each of its Live Sets. When I reviewed this, I suggested to one of Roland's engineers that this was rather limiting, so I'm delighted to find that the Jupiter 50 (and the Jupiter 80 Version 2) now offers five MFX routing options, ranging from a serial path (which allows you to cascade effects) to the previous all-parallel configuration, and three combinations in between. It would be hard to over-state the significance of this. The top level of sound generation is called a Registration. However, unlike the 256 Registrations on the Jupiter 80 (each of which offers a Percussion/Bass Part, two Live Sets and a Solo Part, for a maximum of 10 simultaneous Tones) the 128 Registrations in the Jupiter 50 offer just a Perc/Lower Part, a single Live Set, and a Solo Part, for up to six simultaneous Tones. However, these are not the only significant differences at this level, because the Percussion and Solo Parts have lost their dedicated compression, EQ and delay effects. Furthermore, whereas the Jupiter 80 has three reverb processors (one for each Live Set, and one for the Perc/Bass and Solo Parts), the 50 has just one for the whole synth. So while you can still determine the key range, MIDI velocity range, level, pitch and pan of the Tones inserted into the Perc/Lower and Solo Parts, you can merely determine the degree to which they pass through the global reverb (or not). The Jupiter 50 retains the percussion section first seen on the Jupiter 80. This allows you to allocate the lowest 15 notes of the keyboard to eight non-standard sets of percussion sounds, or use the Drums/SFX option to play one of 16 conventional kits across the whole keyboard (or within the Perc/Lower split, if selected). The arpeggiator is also a cut-back version of that found on the Jupiter 80. Now operating on the Upper and Perc/Lower Parts, it offers the full 128 factory styles of the earlier synth, as well as its Styles and Motifs, but now has just 16 memories for user styles. I doubt that many users will find this restrictive, so it seems a sensible place to cut back the specification a little. Another area with minor omissions is the audio recorder/player. You can still mix and record your own performances, with any audio being presented to the audio inputs, replay audio files from USB sticks, loop within a file, chain files, and alter the pitch and playback speed, but there's no dedicated EQ or karaoke-style centre cancellation provided. Again, I can't see too many people bemoaning the loss of these. Strangely, the Harmony Intelligence auto-harmonising feature is retained in full, and although the system now operates using the Upper Live Set and Perc/Lower Part rather than the Upper and Lower Live Sets, this makes no difference in practice. Whether it's a suitable enhancement on an instrument targeted at the professional synth market is another question. Despite lacking the Jupiter 80's colour touchscreen, editing via the Jupiter 50's 240 x 64 pixel display is still straightforward. Surprisingly, the Jupiter 50 is 1.5 inches wider than the Jupiter 80, although it's less deep and less high, and at just 11Kg it's remarkably manageable for a 76-note instrument. 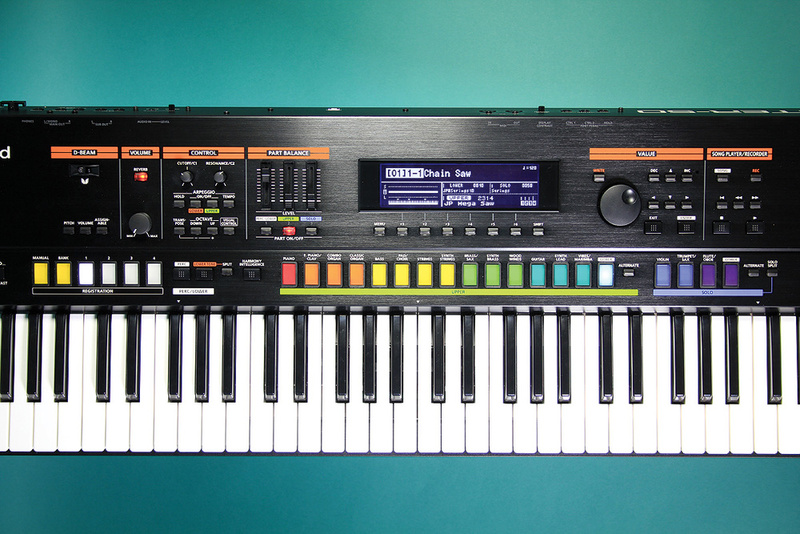 Roland have achieved this by ditching things such as aluminium end plates and turning to lots of plastic. Nonetheless, I found this to be a good compromise between lightweight construction and rigidity. Similarly, its keyboard is pleasant to play, although not up to the standard of the best semi‑weighted keyboards and, unfortunately, it suffers from a huge limitation: Roland have again removed pressure sensitivity from the lower-cost variant of a flagship keyboard. I find the lack of aftertouch to be a significant shortcoming on something advertised in large, friendly letters as 'a performance synth', and the fact that the Supernatural engines still respond to aftertouch messages generated by other controller mechanisms and remote keyboards just adds insult to injury. Oh yes... and it has a wall wart. As a gigging keyboard player, I can tell you that our sound and light company hates these with a passion, and keeping track of them can be a nightmare. What's more, an unusual 2A device can't be obtained easily when the original goes missing during an already fraught setup in the middle of a field on a rainy August bank holiday afternoon. If you want my cash, get rid of it immediately, Mr Roland, and put a sensible IEC socket on the synth. On a more positive note (no pun intended), the Jupiter 50 boots quickly, and the large, colourful patch-selection buttons that helped to define the appearance of the Jupiter 80 are retained, although there are, of course, fewer of them. Likewise, the MIDI specification appears to be largely intact, offering independent channels for each of the three Parts, a control channel to change Registrations, MIDI sync, extensive MIDI CC capabilities, the ability to transmit parameter changes as SysEx data, and more. There's also an extensive menu for controlling external sounds, and this allows you to set up things such as velocity ranges and key zones for each of the 16 channels. 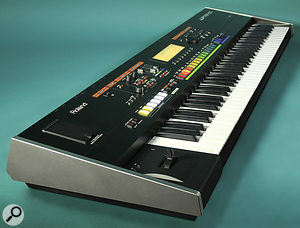 In addition, Roland's V-Link protocol is retained, and this allows you to play selected visuals from a suitable projector, using MIDI Notes or program changes, and CCs or the pitch-bend lever to control the playback speeds, dissolve rates and any special effects applied to images or video clips. I think this is something that could have been discarded on a lower cost instrument, but I'm pleased that it wasn't. 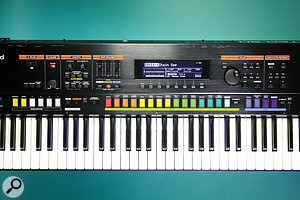 Less surprising is the retention of Roland's 'D-Beam', which allows players to control a long list of synth parameters by moving their hands above the sensor. This lacks the Theremin-like Solo Synth found on many other Roland products, and that's no loss whatsoever. Now we come to the sound of the Jupiter 50, so let's be clear... although the architecture is a cut-down version of the Jupiter 80, the sound is unaffected and remains excellent. At the moment, my favourite Registration is my own combination of a Supernatural Acoustic Flamenco Guitar and three types of orchestral strings. Were I writing a soundtrack at the moment, it would be liberally peppered with this! But that's not to decry the other acoustic Tones. Although the Jupiter 50 lacks the flexibility of previous modelling synths such as the Technics WSA1 and the Korg Z1 (which are excellent instruments in their own rights), the underlying sound quality is undoubtedly superior. However, there is still room for improvement. For example, the TW (Tonewheel) model lacks the Hammond chorus/vibrato effect and, despite the wealth of possibilities on offer, there's no way to recreate the warm purr of a genuine Leslie speaker in the MFX effect processors. More updates please, Mr Roland. So what of the Supernatural Synth engine? Despite the plaintive wails of the analogue anoraks, this is a superb synthesizer. When you consider that you can stack up to 18 synths in a single sound (three Partials per Tone, and six Tones in a Registration), and that up to four of these Tones can have dedicated effects, you get some idea of the sonic power on tap. Of course, not every patch needs to rattle windows, and I was equally impressed by the more subtle sounds that the Jupiter 50 is capable of producing. Furthermore, when I reviewed the Jupiter 80, I placed it next to my Jupiter 8 and found that it was surprisingly capable of emulating the old dear. Now, with its additional filters, the Jupiter 50 can extend its palette of vintage emulations even further. Before playing the Jupiter 50, I wondered whether the loss of a Live Set would be a serious shortcoming, but I don't think it will be. I also wondered whether the loss of the dedicated effects for the Perc/Lower and Solo parts would cause difficulties. To be fair, I noticed the lack of them but, in the grand scheme of things, the extra configurations of the MFXs in the Live Set made up for this. If there's one significant problem in the voicing (and there is), it's a subtle one, and if it's present on the Jupiter 80, I missed it, for which I apologise. When you play Supernatural Synth sounds without unison, the envelopes work on a 'reinitialise from where you've got to' basis, as they should. When you invoke unison, they switch to 'reset to zero' mode, which can create a horrible sucky sound that was prevalent in the 1980s, but which I had hoped I would never hear again. Let's hope that it's a bug or oversight that Roland will address quickly. Finally, if I could make one further request of Roland, it's this: please sort out the issue of hot-swapping USB sticks. Either it's possible, in which case the dire warnings in the manual are unnecessary, or it should be possible. Either way, you need to address it. I fear that people don't understand the new Jupiters. They are not workstations, they are not samplers, they are not master keyboards, they are not 'stage keyboards' concentrating on pianos and organs with a bit of synthesis thrown in for good measure, and they are not recreations of the Jupiter 8. They are modern synthesizers, and damn good ones, too. With their unusual sound engines, they occupy a distinct niche in the keyboard ecosphere and, when more players understand what they can do (rather than concentrate on what they can't), we may start to see a few more of them around. Of course, they're not for everybody, and the Jupiter 50 is still not what you would call a low-cost synth. What's more, if you make extensive use of aftertouch, you'll have to look elsewhere. But if you're after a 'live' synth that's a little different from the norm, you could do much worse than learn to love a Jupiter 50. The review model never missed a beat and, within its capabilities, always did exactly what I asked of it. You can't ask for much more than that. Finally, I can't help wondering whether Roland is considering a pure Supernatural Synth as a future product. Imagine removing the Supernatural Acoustic engine, the Song Player, V-Link, and all the rest, and then giving the remaining synth engine a 61-note keyboard and a physical control panel. I could see that being attractive to many players. Jupiter 30, anybody? One area in which Roland have cut costs on the Jupiter 50 is in the provision (or not) of inputs and outputs. Alongside a socket for its external power supply and a separate grounding point (arghh! — again), it offers stereo quarter-inch TRS jacks for the main audio outputs, stereo unbalanced quarter-inch sockets for the Sub outputs, an output for stereo headphones, a stereo audio input, three control-pedal inputs, MIDI In and Out, the USB2 port for computer connection and the control panel's USB port. This means that — compared with the Jupiter 80 — it has lost two XLR outputs, an S/PDIF output and MIDI Thru, none of which should cause insurmountable problems. When the Jupiter 80 appeared, there was a superficial users' manual, but the promised set of detailed manuals was unavailable. Today, the situation is the same for the Jupiter 50. Indeed, the manual supplied with the review unit still contains Jupiter 80 information and graphics, but that's forgivable because this is, in essence, a pre-production unit. Happily, the Jupiter 80's manuals are now available from Roland US (although not, at the time of writing, from Roland UK). See: www.rolandus.com/products/productdetails.php?ProductId=1165&ParentId=83#. Until the full set for the Jupiter 50 arrive, I would recommend that you download them. While they are not strictly applicable to the Jupiter 50, much of the information is common and will prove useful. Happily, the significant improvements in the Jupiter architecture noted in this review are already available for the Jupiter 80, as a Version 2 upgrade that can be uploaded to the original synth. This means that it too can take advantage of the new filters, the new MFX configurations in the Live Sets, and the ability to control Sonar using ACT, as well as a new Registration Play screen and an enhanced factory sound library. It's a very capable virtual analogue and acoustic modelling synthesizer. The addition of six new filter options considerably extends its VA capabilities. The Live Set's effects structure has been improved significantly. It's light and surprisingly manageable for a 76-note instrument. The best thing about it is the sound, which is excellent. A wall wart on a stage synth? Give me strength! The lack of aftertouch is a significant shortcoming for a performance synthesizer. Supernatural Synth's unison mode has a bug (or is badly designed). While more affordable, it's still not what you would call low-cost. The lack of aftertouch prevents me from describing the Jupiter 50 as a first-class performance instrument, but it's still very capable and it can sound superb. If you're after a stage synth, don't make use of aftertouch, and promise to guard the wall wart with your life, it provides a wider range of sounds than a purely 'virtual analogue' instrument and is a worthy alternative to using a fraction of the facilities of a 76-note workstation.